Last week, I reviewed the cookies from Tout Sweet. I dubbed the "Naughty Peanut" one of the best cookies I've ever had, and even deemed it breakfast appropriate. But, it turns out, Tout Sweet does offer some slightly-more-acceptable-for-breakfast baked goods, so I've tried those too. I didn't love any though, and would rather just have that cookie for breakfast. 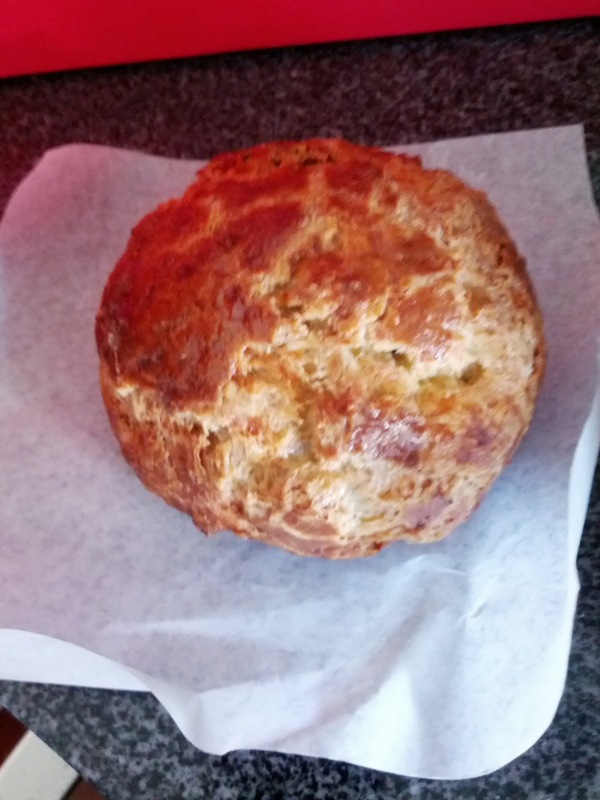 Gougère: Fresh thyme, chive & gruyere cheese. $3.25. Hmm. Eggy, and light, but not cheesy. How was this not cheesy? I got a bunch of these for my co-workers, not really thinking I'd love them, but wanting a savory option for those who don't like sweets first thing in the morning. I cut them in half, and every person took only a half of one, and not a single one of us even finished our halves. We even tried warming them up to make them a bit more exciting, but they really fell flat. Would not recommend, and will not try again. Sadly, I somehow lost the rest of my notes and reasoning on this, so, I don't have much to say except that they were a fail, all around. For those of us who like sweets, I opted for the classic coffee pairing ... coffee cake. The woman taking my order said it was one of her favorite items. I wasn't overly impressed at first. The back crust was almost burnt and very dry. The cake itself was fairly moist, but not very spiced. It all seemed fairly unremarkable. But as I dug in more, I found a lot of subtlety to it that surprised me. It did have a nice level of sweetness, due to the fruit and the streusel, but wasn't overly sweetened otherwise. 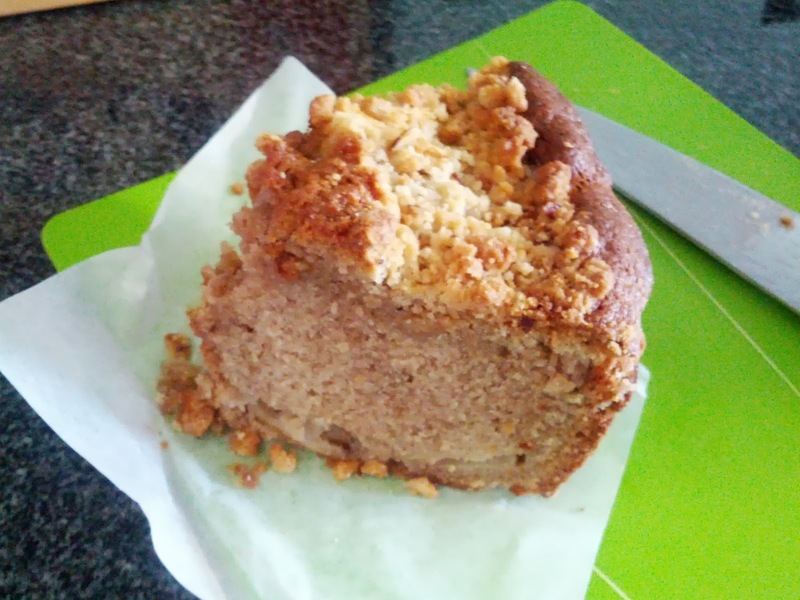 Often coffee cake can be way too sweet, but this wasn't. The chunks of apple? (pear? ) were surprisingly my favorite part. They were the perfect texture, not too soft and mushy, but not too crisp. They seemed to be concentrated as a layer on top, right under the crumble, leaving the rest of the cake fairly plain. Speaking of the crumble, that is where the woman taking my order sold me. She sorta swooned over it. It was made from hazelnuts, and was somehow a bit bitter. Yet sweet like a streusel. I'm not sure if the bitter and sweet play was intentional, or if perhaps the hazelnuts had gotten a bit over-toasted. A few bites also had a tiny hint of salt to them, which really amped up those bites. A nice touch. I think a little bit more salt in the crumble would take this up a notch. The crumble and the fruit were both good in this, and perhaps I just wasn't in the mood for coffee cake, because even though I appreciated those elements, I didn't love the coffee cake. Maybe it was just slightly over-cooked, as I said, the back crust really did seem burnt. I also think the proportions were just a bit off. The fruit was good, but only existed in the very top and very bottom. The crumble was good, but was obviously just on top. Since the cake was so tall, this left a very large center that was a bit boring. I think just making it less tall, although less impressive looking, would have actually made it tastier, as you'd get more flavors in every bite. Or, throwing in a streusel layer or more fruit inside. The slice was absolutely massive for $3.50. It was massive in height, and in width. The photo above is after I'd already taken a huge chunk out of it. My family always served pie slices according to the "one pie is 6 slices" rule. I always thought this was a totally normal serving for a single person. And of course it should have a scoop or two of ice cream with it. And maybe some whipped cream too. Since that is how my family served it, and whenever I went out that is how restaurants served it, it really wasn't until the past few years that I've realized that not everyone eats pie in such size slices on a regular basis. When I go out to restaurants, people, gasp, suggest SHARING a single dessert. They say things about "restaurant portion sizes" being crazy large. Or I go to dinner parties and they carve up their cakes and pies into slices meant for children. I always thought they were being stingy. Turns out, this is what normal people do? My friends now refer to the slices I (or my family) serve as "Parent Family Slices". When I'm serving pies or cakes, people now specify things in those terms. "I'd like a slice of the pecan pie, 1/3 of a Parent Family Slice please". Anyway, rambly story short, this was totally a Parent Family Slice. And definitely splitable. On our recent trip to Sydney, I had only a few places on my list that I really wanted to return to: Ms. G's for cheeseburger spring rolls, cocktails, and epic desserts. Pinbone for dinner and fantastic dessert. Mamak for the sweet roti. Sadly, Pinbone closed, but we did take one venture to Ms. G's (review coming soon! ), and, a few days later, to Mamak. 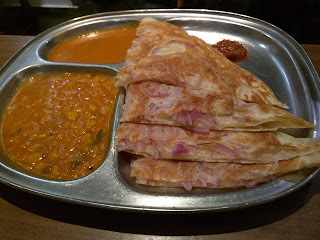 If you haven't read my original review of Mamak, I suggest you start there, and then return here, since I'll skip the general details this time around. Like pros, we arrived right when they opened at 5:30pm, and got into the first seating. We had a group of 3, which was a good size to share a few entrees, and order not one, but two, desserts. Service was as I remembered, a bit scattered and random since you don't have a dedicated server, but fast and efficient. They really move customers through the restaurant as fast as possible. The only other thing I noticed different this time was the paintings on the wall, all of either the exterior of the restaurant, or inside, of patrons dining, chefs cooking, etc. I'm sure these were there last time and I just didn't see them, and I meant to get a photo, but, alas, I didn't. Anyway, on to the food. The savory dishes didn't really do it for me this time around, but man, that sweet roti ... I want more, now! "With lashings of sweet red onions. Served with two curry dips and spicy sambal sauce." I know that Mamak is most known for the roti, but, besides the dessert roti, I didn't recall being particularly impressed with the savory roti before. I voted to skip the roti, but the others wanted it. They got one of the same one we had last time, with red onion inside. It was the first item to arrive, literally moments after ordering it. How on earth did it come that fast? Since I didn't really like it last time, and I knew I really didn't like the curry dips and there was nothing else to dip it in yet, I opted to just skip it, since they seemed to like it. Ojan said it was his favorite savory dish of the night, so perhaps I missed out. "Malaysian-style fried chicken. Marinated with herbs and spices and full of flavour." The rest of the food quickly piled onto our table, within 4 minutes of the roti. I recalled that last time the food came a bit staggered, but, that was not the case tonight. Our table was full, instantly. Last time , you may recall that I had a revelation with the fried chicken. I never like chicken, but, wow, the batter on the fried chicken was so good that I was the one pushing to order the chicken this time. The others went along with it, but certainly didn't really want it. We ordered one piece each, and received two thighs and one drumstick. The chicken was the biggest disappointment of the night. It was ... awful. The skin wasn't crispy, the batter had no flavor. I don't understand how it was so great last time and so truly horrible this time. I tried a few bites, and discarded my piece. Ojan saw me push mine away, and declared, "If Julie doesn't have to finish her piece of chicken, I don't either!" Both our pieces went unfinished. Easily the worst dish of the night. 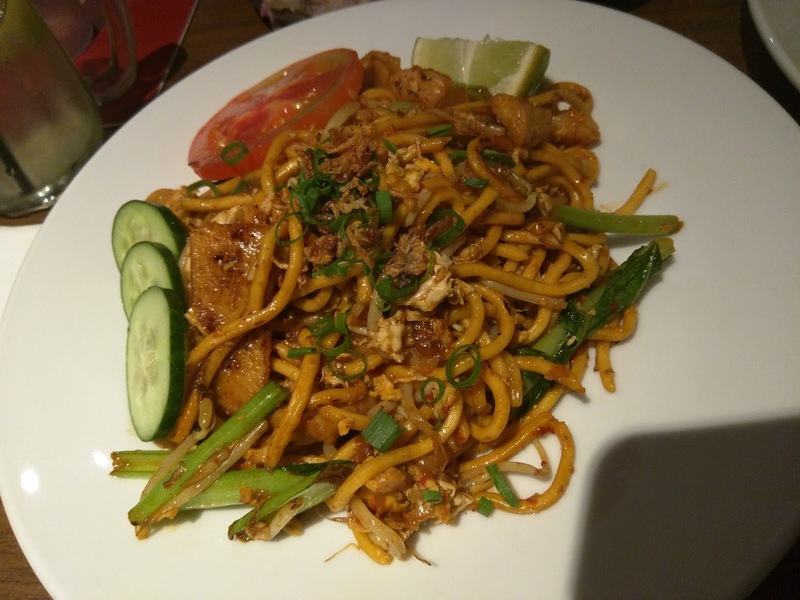 "Spicy wok-tossed hokkien noodles with eggs, prawns, fish cake slices and fresh bean sprouts." Next up, we finally tried something from the Rice and Noodles section of the menu. The noodles came mixed with scrambled egg, small chunks of prawns, slices of fish cake, bean sprouts, and asian greens. On the side was a slice of lime, a slice of tomato, and 3 slices of cucumber. The later items seemed a bit strange, but, perhaps that is traditional for Malaysian food? The lime was great to have, as the dish really needed the acid. The greens were crisp and bitter. The noodles were decently cooked. There was some spicing to the dish. But overall ... it fell pretty flat for me. Ojan seemed to like it well enough though, his second favorite dish of the savories. 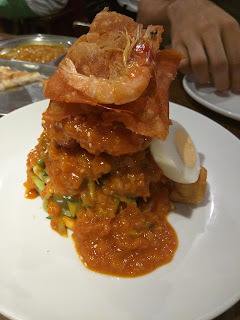 "A Malaysian-style salad. Prawn and coconut fritters, fried tofu, hard-boiled eggs, freshly shredded yambean and cucumber, topped with a thick spicy peanut sauce." Our priciest dish, also from the Mains section, was a salad. Now, why on earth would I order a salad? Well, because it was "topped with a thick spicy peanut sauce". Do you recall my last visit to Mamak, where we didn't like the satay, but I adored the peanut sauce? As in, I ate it all by the spoonful? Yeah, I hoped this would have the same peanut sauce, smothering the salad. Not exactly a healthy, light salad, but really, what do you expect from me? The server did tell us when we ordered that they were out of yambean and had to substitute green apple instead. This almost made me reconsider, but, I really wanted that peanut sauce, and really didn't want the satay. I do wonder if in the future I could just ask for a side of peanut sauce with the roti? That is what I really want, savory roti with something tasty to dip it in. Anyway, I digress. When this salad arrived, the table was fairly stunned. I know the others were skeptical of my ordering a salad in the first place, but, I know they weren't expecting this ... tower. 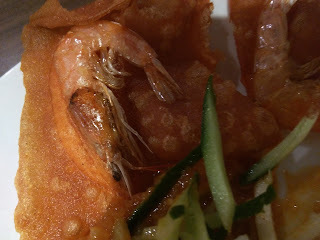 Perched on top of the stack were 3 large prawn chips, that is, chips with actual whole prawns fried into them. I actually liked the chip, particularly when dunked in the sauce, but I didn't like the little prawn ... are you supposed to eat the hard shell? Ojan didn't even try a bite of one of these, so, I got two chips. Under the chips were ... soft bread slices? Maybe these were the coconut fritters? I'm really not sure. But they were soft, orange, and really soaked up the sauce well. I liked them, dunked in plenty of sauce. Are you noticing a theme here? Yes, I liked the peanut sauce. It wasn't quite as magical as I remembered from before, but, it was good. Great peanut flavor, and spicy too. Oh, and there was tons of it, the salad was absolutely smothered in it. Underneath all of the sauce and bread-like products was the more salad-like components, a large mound of shredded green apple and cucumber. The shreds were light and fresh, and actually a nice compliment to the carbs and heavy sauce. And, as much as I don't really like green apple, I have to admit, the apple and peanut sauce really did go well together, reminding me of apple slices with peanut butter that I ate as a snack way back in the day. Also in the mix was fried cubes of tofu, and half a hard boiled egg. None of us wanted the egg. Overall, I liked this in that it was really different, and I liked the peanut sauce, but I wouldn't necessarily order it again. The only savory dish I really liked though. "Paper-thin, extra-crispy and served tall." But we all know I was there mostly for dessert. I absolutely adored the Roti Bom last time. We skipped the non-roti desserts, and moved right to the sweet roti section of the menu, since the other desserts just weren't quite for us before. We ruled out the banana roti, but then were stuck. I obviously wanted the Roti Bom again. Ojan put in a vote for the kaya version, which I also wanted. And our local friend wanted the Roti Tisu, which he said was always good. The sweet roti tisu took a few minutes longer than the savory to be ready, but still arrived fairly quickly after we ordered it. They really keep things moving right along. It was ... very oily. Yet crazy crispy. Very, very thin layers of roti, dripping in oil, yet somehow it wasn't at all soggy. I don't entirely understand. It also was impressive, structurally. It managed to stand upright until the very end, even as we ripped off chunks and unraveled it. One of my dining companions dubbed it an "engineering feat". It really never fell over. But, was it good? Meh. It wasn't bad, but it was really quite boring. The dough was sweet, it was coated in sugar, but beyond that, there wasn't actually any flavor. It just wasn't interesting taste-wise. It was also annoying to eat, although it never fell over, it was annoying to rip off chunks. It was served with a scoop of vanilla ice cream, which none of us touched while eating it. We had no idea how you would even use the ice cream if you wanted it. You couldn't dunk the fragile roti into the ice cream, and you couldn't eat the roti with a spoon, so ... yeah. We didn't use it. "A truly indulgent roti served thicker, richer and sweeter (Allow 20 mins)." 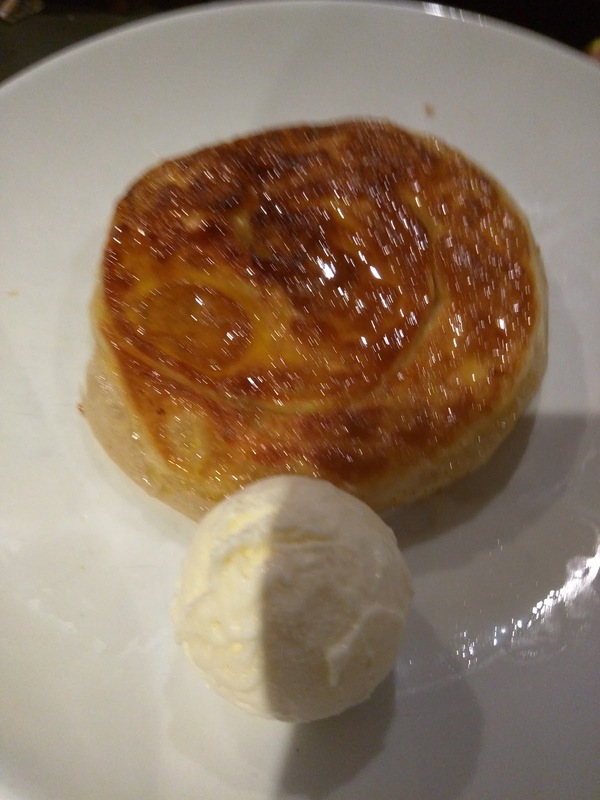 The roti bom also came with a scoop of ice cream, this one fresh, so not melty. Did I ever mention that I love melty ice cream? This turned out perfect, as the other two could split the fresh ice cream, and I got a whole scoop of melty ice cream from the previous dish to myself. We all had what we wanted. The ice cream also makes much more sense with this dessert, as it is warm, and warm dessert and cold ice cream go so well together. Plus, well, you eat it with a fork, so it was easy to get a bite with both ice cream and roti in it. I'm still puzzled by the ice cream with the previous roti. The ice cream was also much better than I remembered. Last time I commented that I wished they didn't serve it with ice cream, and I still think I'd prefer whipped cream, but, I did like the ice cream this time around, it had a good vanilla flavor to it, not plain. But what about that roti? OMG. That is just about all I have to say. The center was doughy, the outside was crispy, it was oily but in a very good way. The whole top side was caramelized. It was hot and fresh. Almost like the most amazing fried dough meets a kouign amann. So, soft and doughy, but crispy and caramelized. Obviously, dish of the night for me, and the others. It made our visit worthwhile. I'd return again just for this dish. I wonder if I could just get it to go? For our final meal in Sydney on our most recent visit , we decided to be a bit risky. I had a long list of places I still wanted to go. Near the top of my list was Rockpool Bar and Grill. 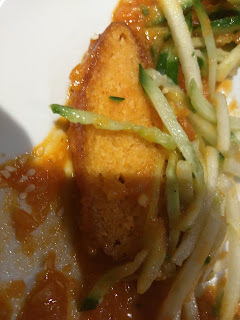 I wasn't flying on Qantas this time around, and thus, it was my only chance to experience Neil Perry cuisine (we hadn't yet gotten there due to always being in a large group, and we were finally just a group of 3). We also never got iconic meat pies, or any of the crazy Asian desserts in Haymarket that I was constantly eying. I still wanted to do all these things. But for some reason, when our final night, a Monday, rolled around, nothing I previously wanted sounded appealing. At Rockpool B&G, I wanted to get the crumbed prawn roll and the onion rings. And great cocktails of course. But a week and a half of eating at restaurants and bars every night had worn me out. I had great cocktails nearly every night. I didn't need more cocktails. I'd been eating huge heavy meals, and fried food in particular sounded totally unappealing. What did I want? What I wanted was carbs. Bready carbs. And sauce to dip the carbs in. Partially, I think I was still sad that I didn't enjoy the roti and curry at Sailor's Thai this time around. Also, the Asian cafe at my office had been serving up great curries with assorted things to dip in, and I had loved them all. It was just the mood I was in. I knew what I wanted. Since my dining companions tend to humor me, I assumed they'd be up for my change of plans, and I informed them around 4:30pm that rather than going to Rockpool Bar and Grill at 6pm as planned and stated on our calendars, we were going to go to Mamak for Malayasian food (in particular, roti). And uh, we needed to leave the office soon. Why so soon? Well, I knew Mamak's reputation. They always, literally always, have a queue. They don't take reservations. If you've walked down Goulburn Street in Sydney, I'm sure you've seen it. I knew that if we showed up at 6pm, we would have a long wait. It wouldn't get better if we went later, and we needed to get back to the hotel to pack anyway. There was only one option: get there before they opened again for dinner service, at 5:30pm. Thus, we needed to leave the office around 5pm, and, since it was our final day, we'd need to start leaving basically at 4:30, since we had a slew of people to say goodbye to. Luckily for me, my buddies took this all in stride, and immediately started packing their things up. 5pm on the dot, our merry band of 3 set off for Mamak. We rounded the corner at 5:20ish, and, well, yup, there was a queue going down the sidewalk already. I hoped we'd make it in the first seating, otherwise we'd need to wait for the entire restaurant to turn, which would easily take an hour. We did make it in that seating, and quite enjoyed the meal. The food was good, the prices really reasonable, and I'd certainly return. I'm already planning what I'll order next time. 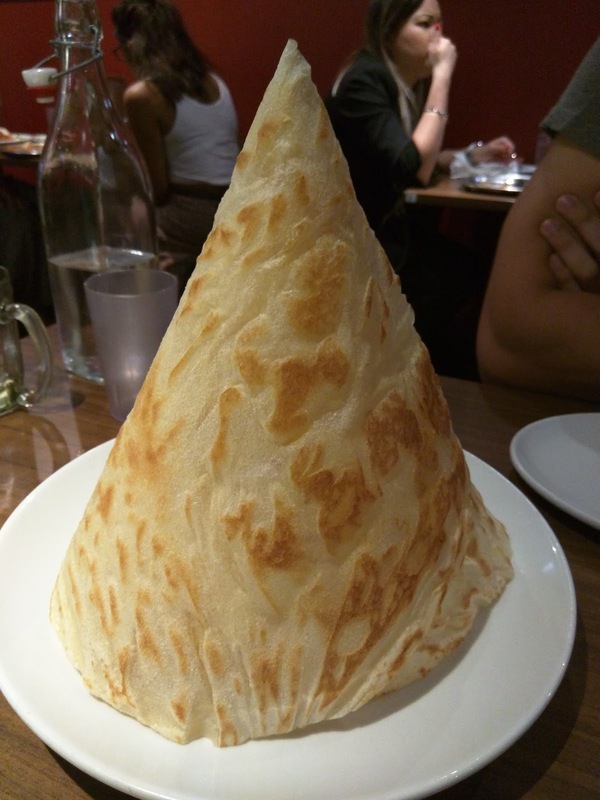 And, since I've returned to San Francisco, I've starting trying to find somewhere with amazing dessert roti, because I just can't get this out of my head! As I said, we made it into the first seating, so it was empty when we entered. The restaurant interior is no frills, wooden tables, already laid out with plates, napkins, and cutlery in the center. Menus are plastic. 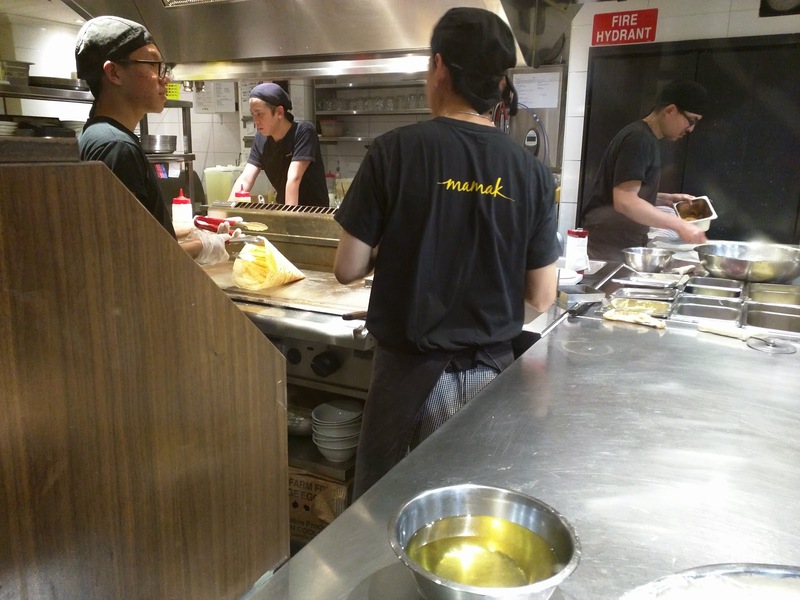 Orders were rapidly taken on an tablet, a very common practice in casual Asian restaurants in Sydney. Once this restaurant starts moving, it doesn't stop. When you are done eat, you head to the register at the front and give them your table number, the waitstaff don't bring checks to your table. That would slow them down. The vibe is loud. As the restaurant filled, which it did immediately, the noise level just kept increasing. By 5:32pm, it was full and energetic. The main savory kitchen is in back somewhere, but right in front is the roti kitchen, making both the sweet and savory roti. This seems to be another common practice in the area, as both Home and Chat Thai have their dessert kitchens right in front in the window as well. It helps give the folks lined up along the window in front something to watch! We didn't have a chance to watch the roti kitchen in action since we were seated as soon as they opened, but I stopped on the way out to admire their work. It really is an impressive setup. The piles of eggs reminded me of Cafe Jacqueline in San Francisco, where they serve basically only souffle (savory and sweet), and the kitchen is filled with eggs. 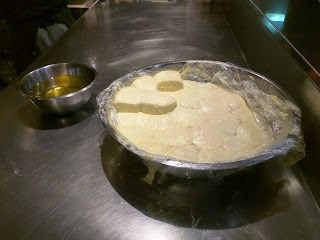 Roti dough was already pre-portions and ready to go. And go they did. 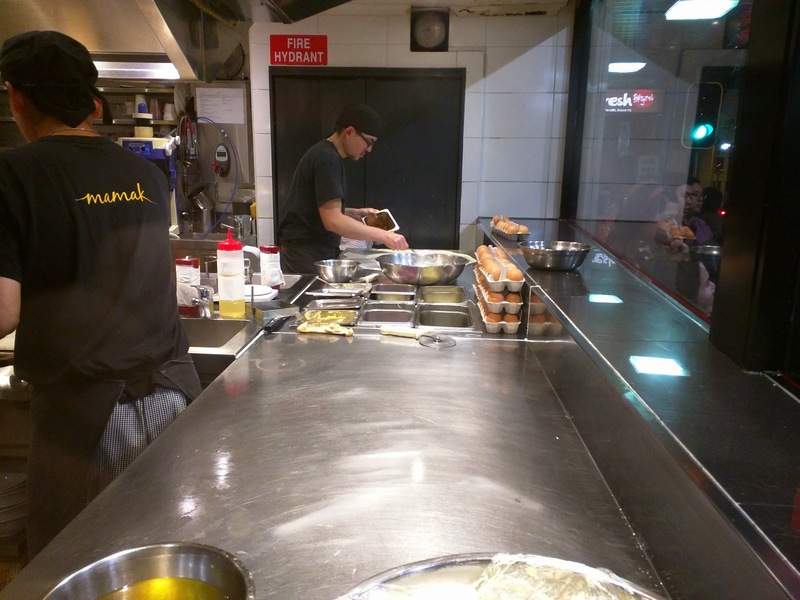 The chefs moved so fast, cranking through orders. And every table ordered roti of some sort. On one cooktop, a sweet roti stuffed with kaya was being prepared. On another was a classic savory roti. And on the third, which you can almost see behind the podium here, the crazy thin cone shaped dessert roti cone was being formed. Each station ha a dedicated function and was busy the whole time. The menu is broken into roti, satay, mains, rice & noodles, and of course, desserts. We certainly didn't order the same way as most folks around us, choosing the skip basically all the mains and rice and noodles. But this was strategic on my part. Even though Mamak wasn't at the top of my list, I had done my research, and I knew which things were supposed to be the best. If I were with a larger group, I would have thrown in a noodle dish, since those did actually look pretty good. Or a curry to have more sauces to dunk roti into. But we were only 3 people, Ojan can't handle food that is too spicy, and we most certainly wanted to save room for desserts (yes, plural), so we had to pick and choose the minimal set of best items. I was amused by the quantities of food ordered by tables around us, until I realized that they too were strategic. 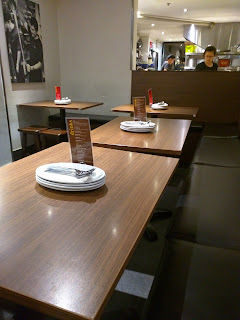 My sample size is only 3 tables, but each and every one of them ordered roti (devoured on the spot), satay or fried chicken (also quickly disappeared), a rice or noodle dish (shared, ate about half of and packaged up the rest), and then several curries (ordered as takeaway, delivered to their tables boxed up in an a bag from the start). They knew which items needed to be consumed fresh, ate those, and brought the rest home, presumably for the next day. That was another way to get it all! In full disclosure, I had actually visited Mamak once before, on my very first trip to Sydney, when some locals took us. They selected the dishes, and I don't remember much, except that both Ojan and I thought it was way overhyped and were annoyed that we waited in line so long for food that wasn't great. I'm pretty sure we got basic roti, curries, and no desserts though. I knew better this time. "Fresh lime with syrup on ice." We started with drinks. Tap water was the only water option, delivered with plastic cups with a carafe of water to refill as you needed. Again, the waitstaff weren't going to bother with you after the initial order. Mamak does not have a liquor licensee, but I saw many folks brought their own wine. We didn't care though, as our previous week was so full of drinking, it was nice to have a night off, particularly when we'd be up early to fly out in the morning. 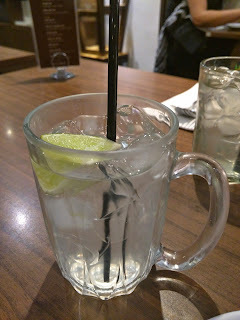 The drink menu is actually fairly large, with both hot and cold beverages, but unfortunately most are tea or coffee based, and since I didn't want caffeine, my only real options were basic soft drinks (Coke products) or this, the "limau ais". The other two diners also opted for one of these. When the trio of cute mugs arrived, Ojan immediately said, "this must be the water?" We all somehow assumed that our drinks were going to be slushies with crushed ice. I have no idea why we all thought that, as the menu clearly just said "on ice". Anyway, it was basically just sweet limeade. Very sweet limeade. I diluted mine down with regular water as I drank it, so by the end, I just had slightly limey sweet water. It was fine, and actually, having a sweet refreshing drink alongside the spicy food was a good call. It wasn't particularly notable though, and in the future, I'd probably just bring my own sparkling water with me. 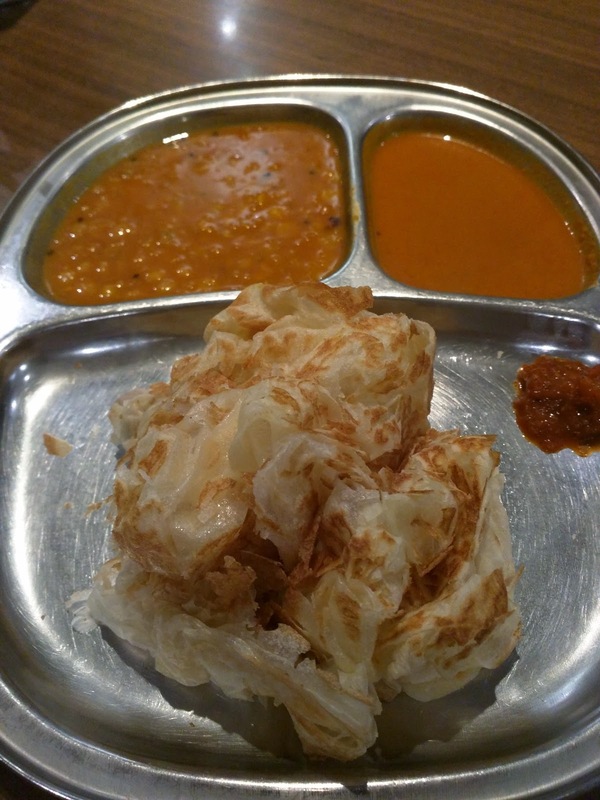 Savory Roti: Roti Canai. $5.50. "The original roti. Crispy on the outside, fluffy on the inside." We obviously had to start with roti, since that is the feature of the restaurant, and, what I was craving. Now, this might not look like what you expect roti to look like, right? Isn't roti supposed to be flat? It turns out, no, not all roti is flat. I knew from reading Mamak's reviews that this would be a unique option, so we opted to try it, new to all of us. The roti canai arrived only several moments after we ordered. It was crazy hot and fresh, and Ojan sorta burned his fingers trying to rip off a piece. It was basically a big puff ball. I have no better way to describe it. Yet the outside was crispy, almost with scales on it? The inside however was fluffy. I thought it was fun to have the contrast of the crispy outside and the soft moist inside, and ripping chunks off (once cooled) was very satisfying (we should have more foods to eat with our hands! ), but, I thought the roti itself was pretty boring. Of course, it should be all about the sauces. All roti are served with two curry dips and spicy sambal sauce. The first curry had whole lentils in it, and was fairly mild. It tasted like ... lentils. And I don't like lentils. Uh-oh. The next curry was smooth, so I was hopeful, but, alas, it was also clearly made from lentils. It was a bit spicier, but, all I could taste was lentils. The sambal was provided in a small portion, just a dollop on the platter, but it was more than enough. This was potent stuff, very fishy, made from shrimp paste, fish sauce, garlic, ginger, shallots, lime juice, and vinegar. I was glad to try this dish, but I wouldn't get it again. $5.50 price was very reasonable. Savory Roti: Roti Bawang. $6.50. "With lashings of sweet red onions." I also wanted a classic flat roti. For regular roti, the other choices are butter, egg, or stuffed with meat and cabbage. Simple butter didn't seem that interesting, I'm not really into egg, and meat seemed too heavy, thus, red onion it was. This roti arrived several minutes after our first one. It too was crazy hot. I really appreciate that they serve the food the moment it is ready here. This one came sliced into triangles, so, no finger burning occurred as we claimed our first bites. I expected the roti to be a bit crispier on the outside, this was mostly just soft. It wasn't too oily. It was absolutely loaded up with thin slices of red onion. The onion was incredibly flavorful, which I appreciated, but, I again didn't care for the curries, since they were the same as before, lentil based. 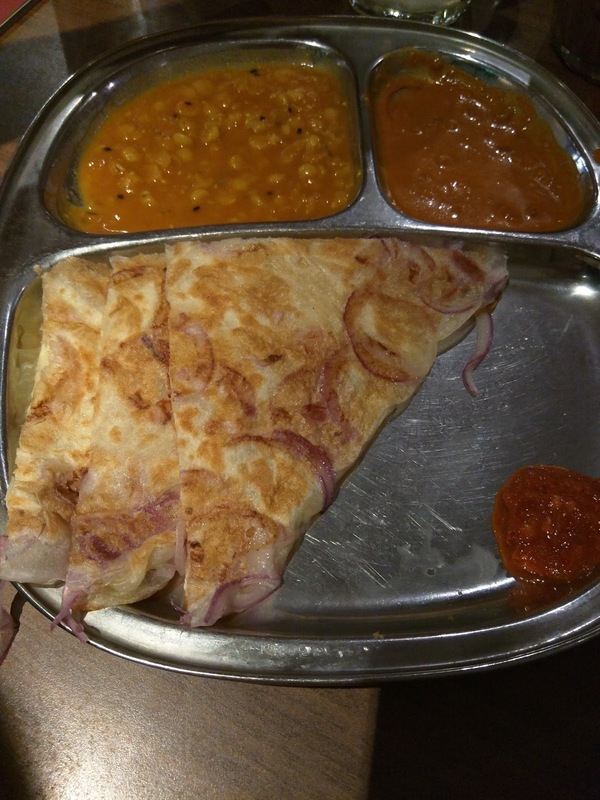 I liked this more than the roti canai, but, I actually think I might just skip roti next time around. Or I'd get it, but also make sure to have a curry alongside so I had something else to dunk it in. $6.50 price is totally affordable. Appetizer: Beef Satay. $9/ half dozen. "Grilled over flaming charcoal for that authentic Malaysian flavour. Served with a sweet and spicy peanut sauce." 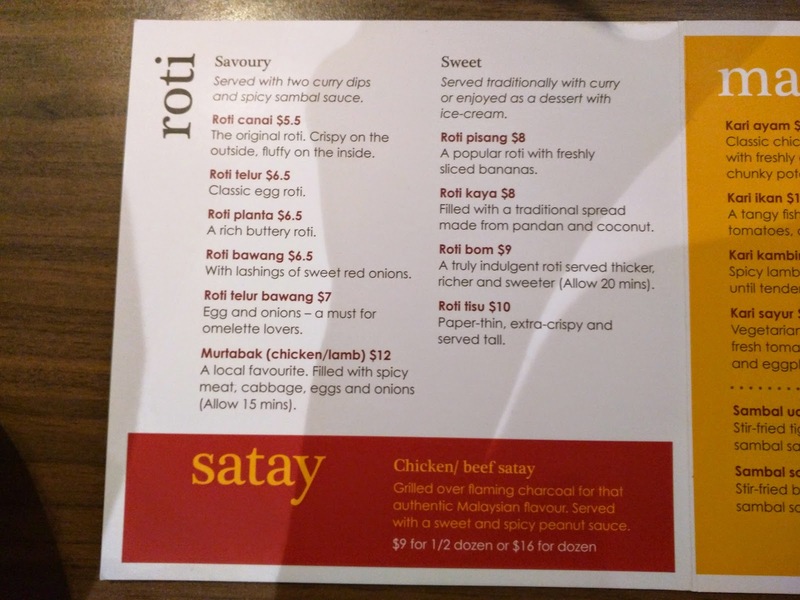 The next part of the menu is satay, available as chicken or beef, by the half dozen. It is the only appetizer, although I think they consider the savory roti appetizers too. Since I don't like chicken, beef it was. The satay took a fairly long time to arrive after the roti. Once I realized how much I disliked the sauces, I tried to save some roti to dunk in the peanut sauce that I knew was coming with the satay. But I had a dilemma, as the roti got cold long before the satay arrived. I saved it anyway, and used it with the sauce, but, this wasn't ideal. Anyway, the satay. Thin skewers of beef, cooked very well done. It was ... just beef. It was fine, but I didn't really taste the charcoal grill at all, and, obviously, this is not how I like my beef. Ojan said he thought his family would really like it. On the side were a few slices of cucumber and red onion. 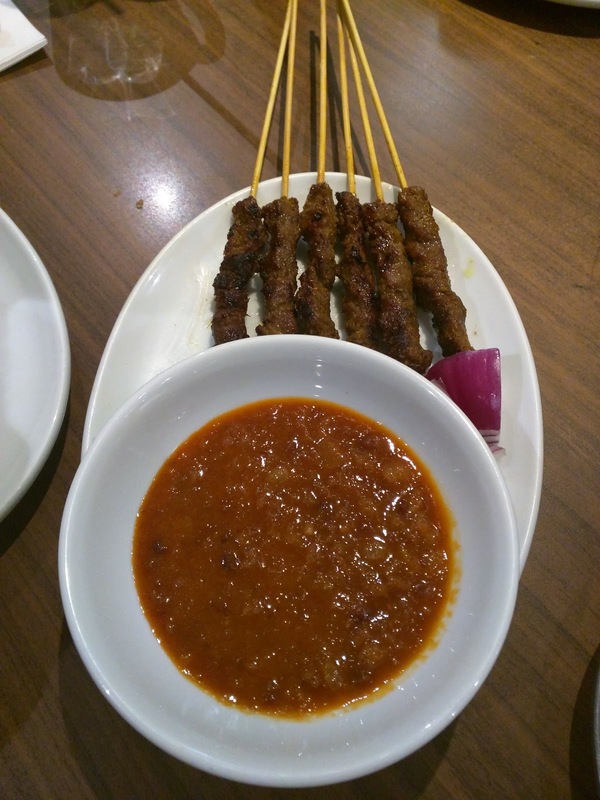 We enjoyed stabbing them with our skewers and dunking them in sauce. And now for that sauce. When the dish arrived, I thought the size of the bowl of peanut sauce was a bit extreme. A huge bowl of sauce for only 6 little satay skewers? Really? I was grateful for that sauce. It was crazy delicious. Not like any other peanut sauce I've had before, but I realized that I've never had Malaysian peanut sauce before, only Thai style. It had chunks of peanut, but seemed onion and tomato based? It was sweet and spicy at the same time. I used it with my cold roti. I used it with chunks of cucumber. And then, no shame, I just ate it by the spoonful. Over and over again. I really loved the sauce. I'd purchase it by the bottle if they sold it. I'd get satay again in the future only in order to have the sauce, but, I don't actually want the satay at all. The $9 price seemed fine for satay and a generous bowl of deliciousness. Next time I would like to actually get the single salad on the menu. It looked really interesting, topped with prawn and coconut fritters, and absolutely smothered in this peanut sauce. Since I ate that sauce by the spoonful, clearly, I was looking for more things to put it on, and some refreshing vegetables might be just the answer. Next time. The majority of the menu at Mamak is main dishes, predominantly curries (chicken, fish, lamb, veggie), stir fries (prawns, cuttlefish, chicken, spinach, long beans), noodles, or rice (fried rice, or a simple dish that is actually just a pile of coconut rice served with some accompaniments, apparently Malaysia's national dish, but it looked incredibly boring to me). 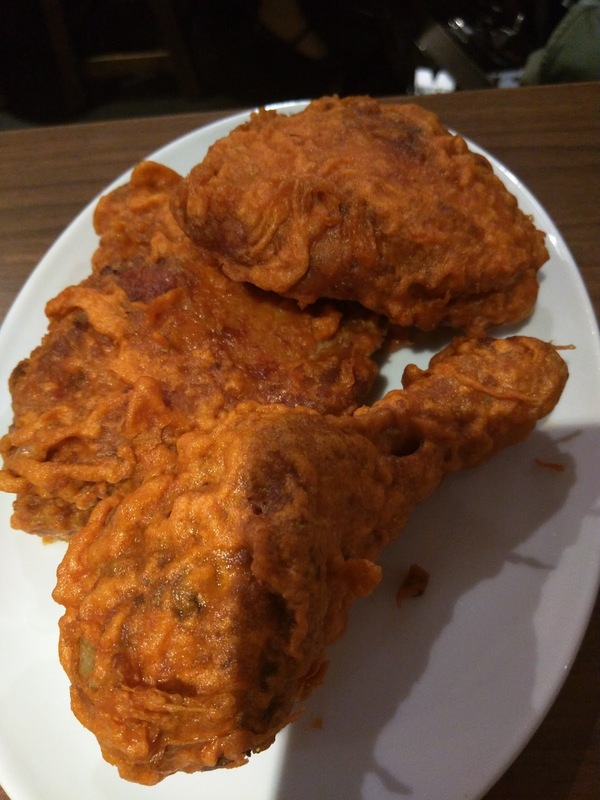 Besides the curries, stir fries, rice, and noodles, there is the aforementioned single salad and this, the famous fried chicken. We skipped all the mains, except the chicken. Yes, the chicken. Yes, I hate chicken. But just go with me here. We saw orders go by of many of these others dishes, particularly the rice and noodles, but I feel no remorse for skipping them. I had read so many reviews of how great this chicken was, plus, honestly, I was excited for the roti and dessert, I figured I'd try a bite of the chicken, and just load up on the items I was more interested in. Ojan totally called me on this, realizing that I was basically ordering it for the others, not myself. He explained to the other diner that I was looking out for their needs, even though they hadn't voiced any preferences. When the chicken came, Ojan took his first piece, took a bite, and offered me a bite. He expected that I'd take one bite, say, "eww, chicken", and hand it right back. I didn't. I took one bite. I think my eyes might have gone wide. I took another bite. I probably looked dumbfounded. The fried chicken was nothing short of amazing. I honestly didn't know you could make chicken taste this good. The batter was flavorful and spiced. The exterior was super crispy. 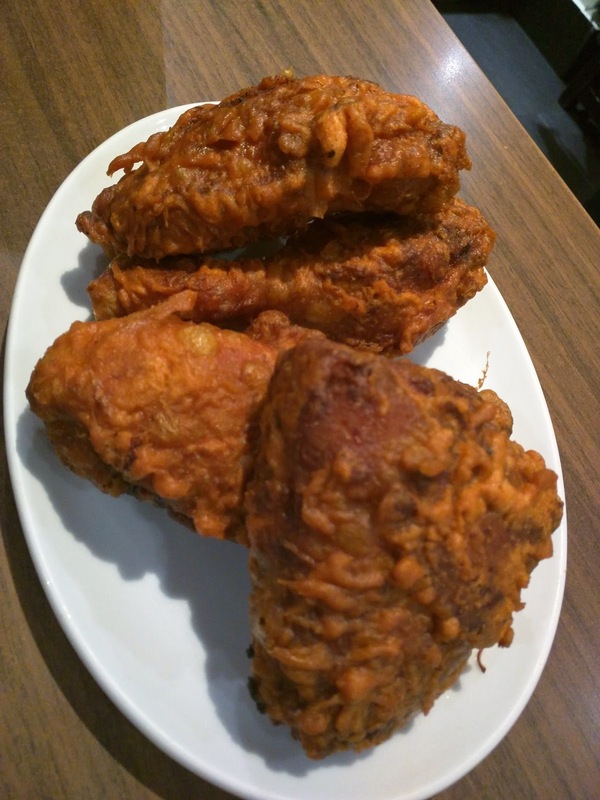 Seriously, all other crispy chicken just tries to be this, and never succeeds. And inside? The moistest, juiciest chicken I've ever encountered. Every bite had juices pouring out. How did they make it so crispy? How did they lock the juices in? I have no idea. I can safely say that I have never enjoyed chicken this much. It was actually good. Yes, I would have preferred that they had battered just about anything else in that flavorful batter and made it magically crispy. I didn't actually want it to be chicken. But for chicken ... wow. I ate more of the actual chicken than I ever expected, but also totally massacred a piece eating just the crispy outside. Yes, chicken skin, batter, and oil. Remember when I said that I didn't want heavy, fried food? Whoops. Our order of 4 pieces had two drumsticks and two breast/thigh chunks each. I think we probably could have specified a preference if we had one. Available by the piece for $4 or a standard serving size of 4 pieces for $14, which is what we opted for. I'd get this again. Yes, the chicken. "Starch noodles made from fresh pandan leaves, with gula-melaka syrup, coconut milk and shaved ice." Moving on to dessert. 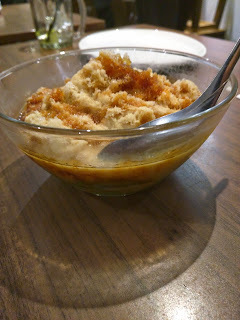 There were two non-roti options, both based on shaved ice. One involved red bean, corn, grass jelly, and rose-syrup, which did sound interesting, but, we had to go for the one with pandan, since we were fascinated by pandan on this trip and ordered it every opportunity that we got. You just don't see pandan often in the US. This dessert arrived very quickly after we ordered it, and new silverware was brought out (3 spoons, 3 forks, and 1 knife), but no share plates. The dish itself was served with one soup spoon inside, which none of us ended up using, opting for our personal regular spoons instead. The base of the dessert was bright green pandan noodles, which you can't actually see here. They were soft and had a decent texture, not too mushy, not too hard. The flavor was subtle, but, I think that is how it generally is with pandan. The noodles were swimming in a broth made from coconut milk. It was a thin broth, not thick like the coconut cream often served with Thai desserts. It was sweet and fairly coconuty. On top was the shaved ice, very thinly shaved. It was a cold day, so I didn't actually want a cold dessert, but, I think this would be very refreshing on a hot day, and actually went really nicely after a spicy meal. While we opted away from most of the spicy dishes, if we'd had the curries, we'd certainly want this. Drizzled all over everything was the gula-melaka syrup. None of us knew what that was so I had to look it up. Gula-melaka is just palm sugar. It was obviously sweet, a richer flavor than standard sugar, and almost tasted like coffee. Overall, this was interesting. A dessert made with noodles in broth with ice is certainly outside the realm of normal American desserts, so I appreciated trying it. And I did like the coconut and pandan flavors. But, certainly not something I'd order again. Maybe I'd try the other iced dessert? $6 for a full size dessert seemed like a great price. As I said, there were two shaved ice based desserts. But there is also an entire dessert roti section. 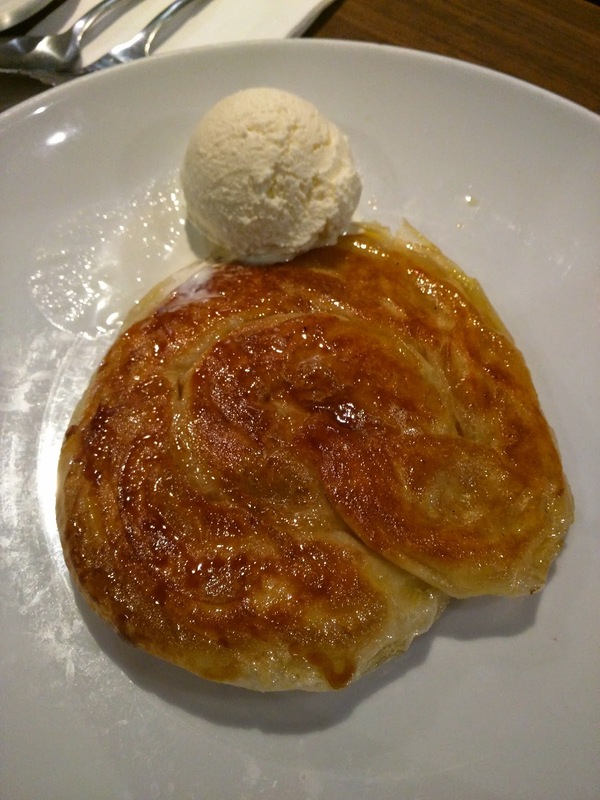 Dessert roti are available in several forms, starting with a simple version with sliced banana, a crazy thin tall cone version, or one stuffed with kaya (pandan and coconut spread), all served with ice cream. I did actually really want the kaya one, since I have enjoyed kaya in the past (like the dessert at Ms. G's where I first discovered it), but in choosing only one roti, I couldn't get past the roti bom. First, it was described as "truly indulgent" and "richer and sweeter". Um, hello! Plus I'd seen photos, and had a good idea what to expect. I'm a bit surprised they serve this, given that it takes 20 minutes to prepare, compared to just several minutes for the others, and their desire to turn the restaurant around so quickly. It came long after our other dessert. It meant we sat there occupying a precious table for far longer than necessary. But, I'm sure glad they offer it. Like all the food, it came to use ridiculously fresh, piping hot. We suddenly understood why we were provided with one knife, it was to cut this up, although that was no easy feat. The exterior was crispy and somewhat caramelized from all the sugar. The very middle was doughy and warm, which I adored. The entire thing was indeed rich and indulgent. It was also very sweet. To cut the sweet was the scoop of vanilla ice cream on the side. Not much to say about that, it was just vanilla ice cream. I love cold ice cream with my warm desserts, and this certainly needed a creamy component on the side, but I would have preferred whipped cream. Ice cream was just a bit much. This was really quite good, and I'm glad we ordered it. My favorite part was the doughy center. 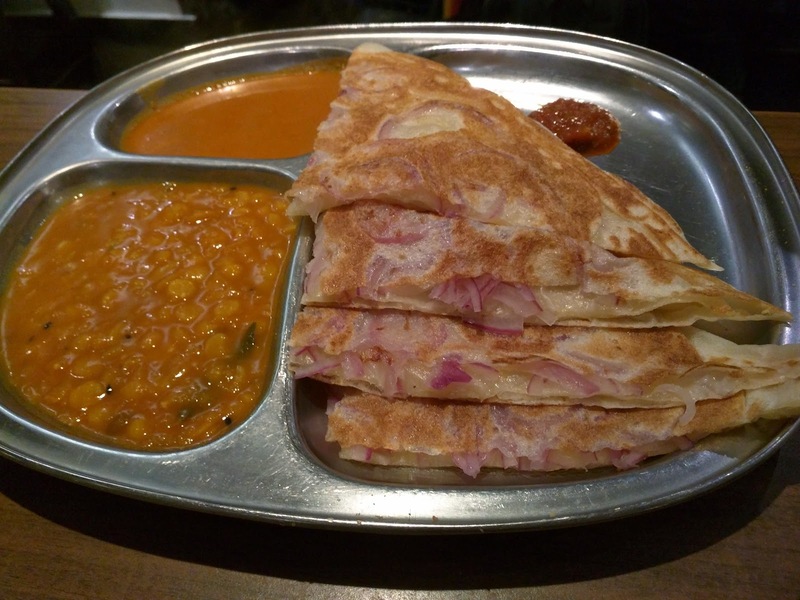 I'd get this again, but I'm also still curious to try the standard less sweet, less thick, kaya stuffed roti. The $9 price was again totally reasonable for a full size dessert, particularly given that it came with ice cream too. Since leaving Sydney, this is the dish I haven't been able to forget. I want more. Now.